Almuñécar is situated just 30km along the Andalusian coast from the popular village of Nerja, yet it is one of the region’s hidden gems. Its authenticity, wonderful bathing and literary heritage give it the edge over its more famous rival, so read on for why you should visit Almuñécar rather than nearby Nerja. Nerja’s main beach, Playa Burriana, is undeniably beautiful and for that reason it is one of the busiest stretches of sand on the Costa del Sol. But due to the underdog status of Almuñécar, the latter town’s principal beach – Playa Costal Tropical – offers much more space. Whereas you’ll often be jammed in beach-towel-to-beach-towel on Burriana (especially when the predominantly British tourists take over in the summer), you can really spread out on Almuñecar’s beach, where some wonderful bathing can be enjoyed in the clear blue water. The rocky outcrops that surround Playa Costa Tropical are also great for snorkelling, and the sand backs on to a promenade lined with lively chiringuitos. Nerja is not lacking in seafront bars and restaurants, a few of which serve some of the best seafood on the south coast. Many of its chiringuitos, though, are plastered with menus entirely in English, which is always a bad sign. Almuñecar, on the other hand, offers two buzzing promenades – the Paseo del Alitillo and the Paseo de la Calatilla – packed with chiringuitos catering for every taste. Some wouldn’t be out of place on Marbella’s blingtastic Nikki Beach (white leather sofas etc), while others have a rustic, hippy style (wicker awnings and sand-covered floors). Yet given Almuñecar’s relative obscurity with foreign tourists and its popularity among Spaniards (especially those from Granada), you’re unlikely to hear much English spoken in most of them. Until about the late 1950s, when Spain opened its doors to the world’s tourists, the principal trade of both Nerja and Almuñécar was fishing. And whilst Almuñécar’s seafront is much changed since then, the old town has lost none of its charm. An enchanting quarter of steep lanes and whitewashed houses not unlike Granada’s Albaicin, it extends up the hillside above Playa Costa Tropical and is divided up into sections called ‘manzanas’ – apples. Locals sit outside their houses gossiping and subject visitors to friendly scrutiny as they walk past – foreigners are still a much rarer sight here than in tourist-filled Nerja. And awaiting you at the top of this lovely barrio are some stunning views out over the rocky coastline and the bright blue bay beyond. Almuñécar is quietly proud of its literary heritage, which stretches back to the outbreak of Spain’s Civil War in the summer of 1936. At that time, the English writer and Hispanophile Laurie Lee (1914-1997) was living in the then-quaint little fishing village, from which he had to flee back to England when the conflict began. Lee immortalised Almuñécar – in his distinctive, highly-romantic style – as ‘Castillo of the Sugar Canes’ in 1955’s ‘A Rose For Winter’, which is a must-read for anyone who loves Andalusia. On the Paseo del Altillo stands a monument to the writer that was unveiled in 1988; when he saw a photo of it, Lee apparently joked that it would be ‘indelicate’ to say what it looks like. Unlike many towns on the south coast of Spain (including Nerja), Almuñécar is not defined by beach-related activities and has a rich history to explore too. Its principal historical attraction is the San Miguel castle, which sits proudly at the top of the old town commanding magnificent panoramic views. The castle dates from Almuñécar’s Moorish period (755-1489) and from 1830 was used as a cemetery until restoration work began in 1986. It is now one of the most impressively restored Moorish fortresses in Andalusia, with particularly notable outer walls. Castillo San Miguel is also home to a small but fascinating archaeological museum, in which you can view artifacts dating from the town’s Moorish and Christian epochs. Partly because it is a popular beach destination for Spaniards – especially those from Granada, just a one hour drive away – Almuñécar feels much more authentic than a lot of other towns on Spain’s south coast. 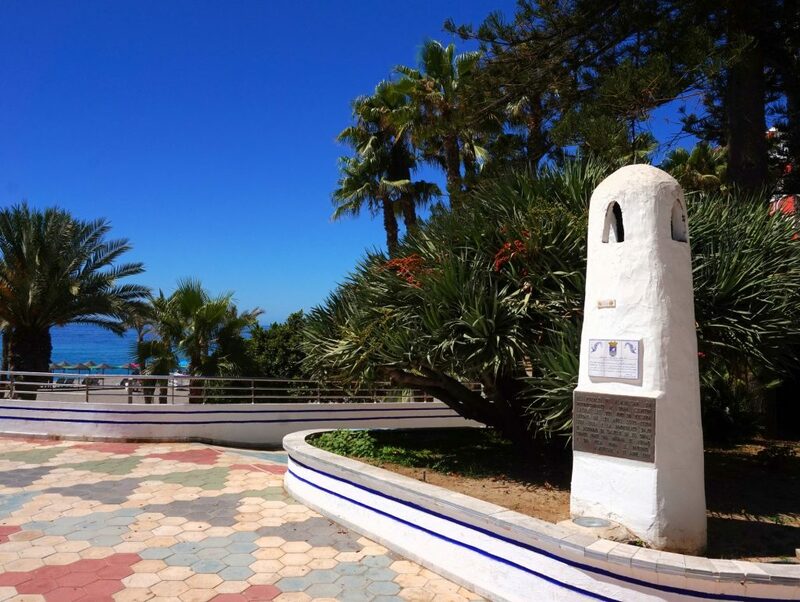 It manages to be welcoming to foreign visitors without being defined by their presence – a tricky balancing act that Nerja has not pulled off quite so well. When combined with a slightly alternative feel, this authenticity gives Almuñécar an ambience all of its own, one that you don’t come across in many other coastal towns in Andalusia. A day here affords you a feeling of discovering somewhere new, somewhere a little too obscure for other tourists – a feeling which every true traveller embraces. Nerja might have its famous caves, but Almuñécar boasts one of the best miradors (viewpoints) on the south coast – a towering outcrop of rock called the Peñón del Santo. The views of the beaches, the distinctively rocky coastline of Granada and the sea stretching out to Africa beneath you are quite spectacular and well worth the 200-odd steps to the top. Visitors fasten padlocks onto the iron bars surrounding the mirador, whilst others mark their visits by engraving their names on the giant rock on Santo’s northern tip. The cross perched on top of this rock celebrates the Christian recapture of Almuñécar from the Moors in 1489.